New in The Three Valleys. New lifts in The Three Valleys, New Piste in La Tania. New for 2006 / 2007. There's a new 6 man chair that is replacing and extending the Chatelet chair near the Plattieres 2 & 3 Gondolas over in Mottaret. It looks like they are renewing the Lac Bleu Poma drag lift and reshaping the top of the Lac Bleu and Loze Est pistes (this is the run mainly used down towards Biollay and Courchevel 1850 from the Col De La Loze above La Tania). 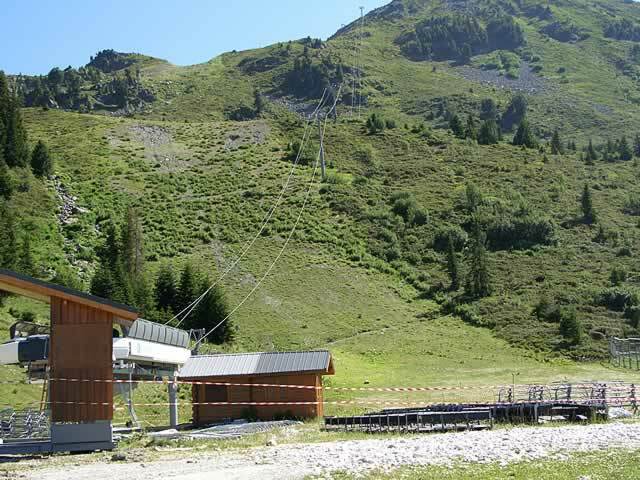 A new cable was installed on the Dou des Lanches 4-man chairlift above La Tania during the Summer - missed seeing how they actually did it though! 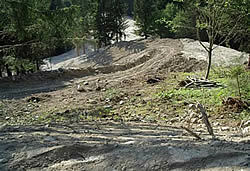 The La Tania green run from the top of the gondola has seen major earthworks on the difficult double bend / S bend to make it wider and less steep. Where the green piste/Plan Fontaine meets the red piste/ Moretta Blanche a new section has been made that goes under the bubble and then back onto the red then into the woods above the chalets and onto Folyères. This should iron out the last of the steeper sections allowing beginners to ski back down to the resort utilising the green run and the easy blue Boulevard des Arolles track above from the link to Courchevel. We've now got hold of the first issue of the Tourist Office La Tania map PDF Version (550k) plus we've a scanned La Tania 2006/7 brochure versions in Hi Res (350k) or Lo Res (170k). 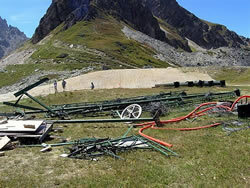 New Gazex avalanche control machines have been installed around Suisses - this follows a fatal avalanche last season on the popular off-piste section to the right hand side of the chair. 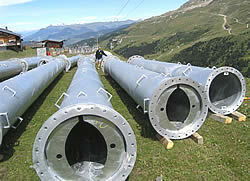 Further improvements to water retention to provide more snow cannon utilisation are also being made. In 1850 building work continues apace with new hotels (no Hotel Moscow yet! ), no more Fat Face (although they're opening in Dubai!) or Whitestuff in Courchevel and the new Gendarmarie looks like it'll be finished for Winter. In 1650 the demolition of Ingham's Fluride Hotel (the live music and BBQ place) is quite sad with lots of memories of long lunches over there. Lots of new chalets going up right on the pistes and the New Space Bar is now the Le Moriond Lounge. In 1550 Ski Power have taken over the Hotel Chanrossa and the bar there will be renamed The Empire. In Le Praz the cash point has been removed - no word on when a replacement is going to go in yet. More work on the "Relax Area" on Plan des Mains at the Mont Vallon gondola base station has been completed and more restaurants to choose from - from fast food to gourmet no doubt. There's plenty of further snow cannon and piste improvement work going on throughout the valley. A new section of the Gelinotte piste giving an easier route down to La Chaudanne plus new snow cannons on the piste running down from the Plan de l'Homme chair (where there's a new snow cannon reservoir) and at the Moon Park fun area. The Golf Course has fully reopened following a €1.5m improvement and Le Plantin (on the road between Méribel Village and La Tania) has been rebuilt and is to re-open in December. The first 4 star hotel in Les Menuires, The Chalet Hotel Kaya opens at Christmas and road improvements mean Val Thorens traffic won't pass right through Les Menuires. Snow cannons have been added at the top of the David Douillet piste and the Bettex piste. Improvement to the Laudzin, Christine and Tête Ronde pistes and new snow canons on the Blanchot and Laudzin pistes. Work on the toboggan run at Val Thorens has been completed - 6km long with 700m vertical and floodlit on Wednesday evenings with late opening of the Funitel de Peclet. Commune has passed agreement to have a security guard with dog to patrol the resort from 11pm till 3am throughout the Winter season - this should help keep late night revelers noise down on their way home and prevent any re-occurrence of break-ins and ski locker thefts that have occasionally happened in the past. Next Summer should see new VTT runs down to La Tania, with a blue descent from the top of Bouc Blanc to the centre of the resort via Folyères and the forest. 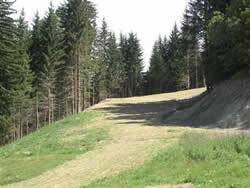 It will be tracked using diggers in a snake pattern from one side of the piste to the other with a width of 1m to 1.5m. There will also be the possibility of a red descent down the Fontaine piste. Also for next summer is the creation of a track starting from the top of Troika to finish at the bridge by the Grand Bois with a permanent timing feature to race against the clock. The track will have raised banks & steps, will be free and aimed at families, children etc. The Britannia Apartments above the Ski Lodge will be closed next summer for renovation but of course the Ski Lodge will still be open. Maeva clients will all be in Grand Bois Residences.